Who are Unitarian Universalists (UU’s)? What are the cornerstones of the UU religion? Check out the Unitarian Universalist Association’s short video, We Are Unitarian Universalists, found HERE, to learn more about our religion and who we are. What do we, as Unitarian Universalist’s, promise each other? What role does covenant play in our religious community? Check out UU Covenant: What Do We Promise One Another, found HERE, for an exploration of covenant and Unitarian Universalism. Check out this 10-minute video, Voices of a Liberal Faith, found HERE, for a deeper exploration of Unitarian Universalist beliefs, faith development, education, worship, and commitment to justice. Includes testimony from UU’s of all ages. Hey kids ~summer is a fantastic time for UU reading. The UU Children’s Summer Reading List, found here, contains an extensive list of books organized according to the seven UU principles. Many are available in the Eliot Children’s Library, while others can be checked out of the public library or purchased. These books can also be great tools for family discussion of UU themes this summer. Hey kids, click here to meet Alice the Chalice and find UU coloring pages, activities, mazes, and YouTube films. Alice the Chalice is a UU kids resource created by UU minister Rev. Amy Freedman and UU consultant Peter Bowden. Families, you can also check out Peter & Amy’s YouTube film You’re A Uni-What?, found here, which explores the Unitarian Universalist religion and common misperceptions people of all ages have about the UU faith tradition. Families: Weave a Tapestry of Faith is the pullout section from UU World magazine containing stories, activities, and conversation starters for families which are drawn from Unitarian Universalist curricula and resources. All editions from 2009-2018 are available in PDF from the UUA website, found here. The story title, topics, and parent reflection are all noted under the edition. Check out UU Family Quest’s YouTube Channel, found here. Family Quest is a project of the UU Church of the Larger Fellowship and offers families short videos and film clips on spiritual practices, UU identity, world religions, holidays & holy days, UU parenting, and much more. 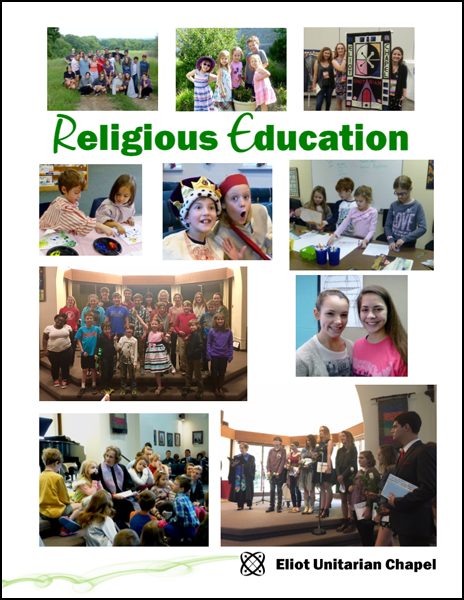 Click HERE to explore background information, recommended books, blog posts, and curricula related to children’s faith development in Unitarian Universalism. Note that many of the recommended books can be found in the Eliot Chapel libraries. Click HERE to discover UU stories, videos, and computer games for children from UU religious educator and parent Michelle Richards. Resources include a list of books arranged by UU principle, a series of videos on different UU-related topics, and a UU parenting survey. Parents and Family Members, click HERE to explore archived editions of the UU World Parenting Blog on a variety of topics relevant to UU families and children, authored by UU educator and parent Michelle Richards. Parents and Family members, click HERE to discover an extensive list of resources, both print and online, provided by the UUA related to parenting and family life. Topics include spirituality, social justice, religious development, and family living. Note that many of the books are available in the Eliot Chapel libraries.